All of the lights, all of the lights. 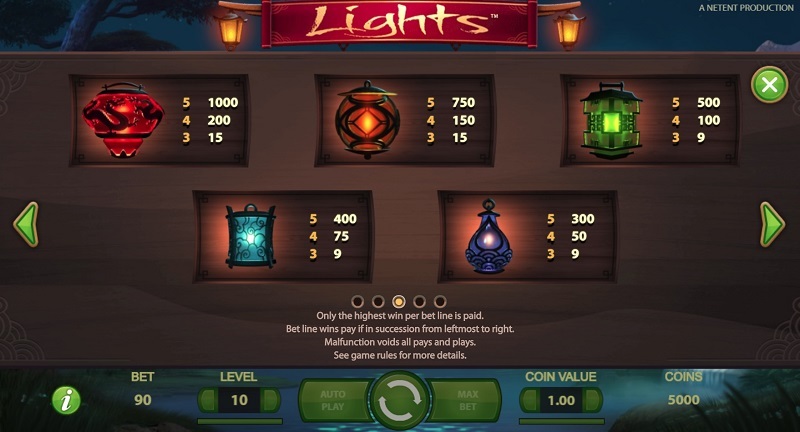 Turn up the lights in this slot, yeah. Extra bright I want y’all to see this. 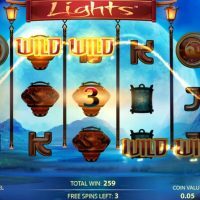 Lights is a lovely looking, simple slot brought to you by the masters of the slot game genre – Net Entertainment. 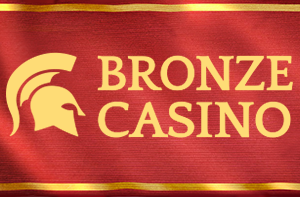 Featuring just 9 paylines, this game is a little bit different to the usual ones out there, and in turn, there are a lot of quick wins, plus easy and regular access into the bonus round. 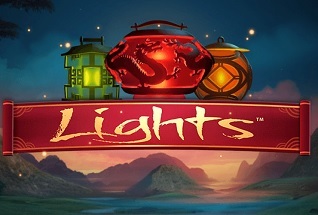 Aesthetically, Lights is delightful and played upon the backdrop of a beautifully relaxing, meditation-themed, melodic soundtrack. With regards to the symbols, as you might expect, they are all lights (or lanterns to be precise) with a red, an orange, a green, a blue and a purple lantern all featuring plus the traditional A’s, K’s, Q’s, J’s and 10’s. 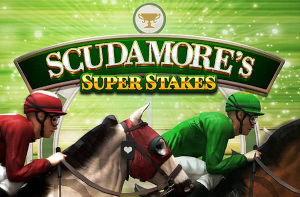 The best symbol to hit is the red lantern which pays out 1,000/1 should you hit five in a row. 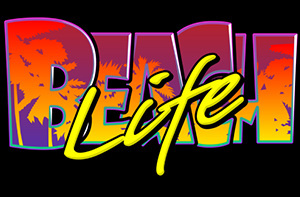 The bonus round is triggered by hitting three scatter symbols or a scatter symbol which has a Wild on it. 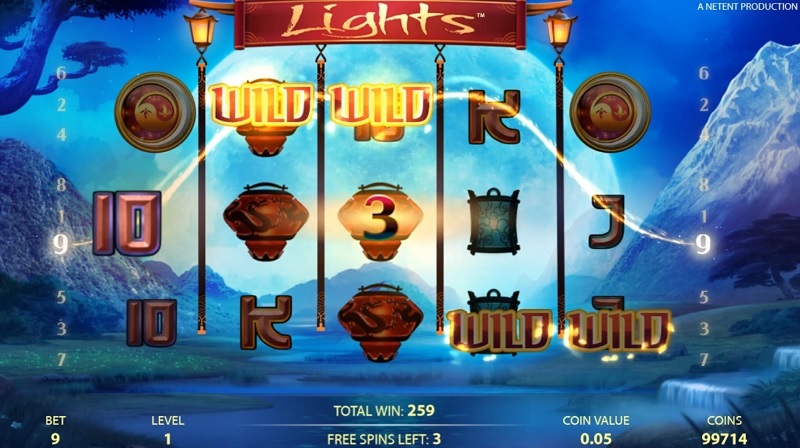 You can’t bet on different lines on Lights but you can bet between 90p and £90 per spin. The house edge is a decent 3.9%. There is a decent autoplay option, which comes with a number of autostop options. 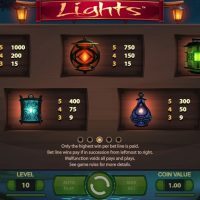 Lights is the slot game to play if you just want to chill out, or you’re feeling a little bit fragile. 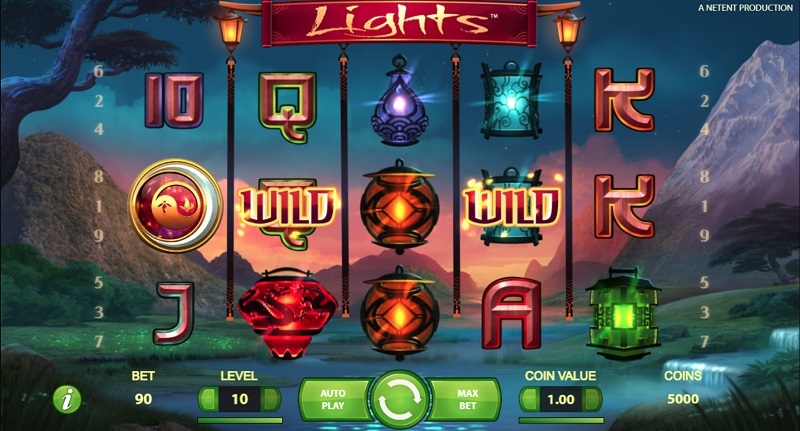 With a serene visual backdrop accompanied by a beautifully calm soundtrack and a gentle ping softly smattering your eardrum every time you press play, this slot is so relaxing you could probably meditate alongside it. 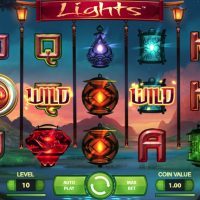 Add in the fact that the house edge is below 4% and the wins you get are quick and often, then you can’t not entertain this alluring slot game – especially on a delicate day.